Daiya Review! | Eat More Plants. I’ve been on the fence about trying Daiya, which is a soy-free faux cheese. I’m not big into replacing things like meat and dairy with tofu and other soy based products. So although Daiya is soy-free I guess I was just avoiding it, hoping that it would be terrible. Well…it’s not terrible at all. I broiled some Daiya cheddar onto tortilla chips with salsa and it melted perfectly! I was shocked. I thought it was going to get rubbery or hard and weird when I altered its temperature. So I also made a sandwich using these awesome gluten free buns from Amy’s in the freezer section. 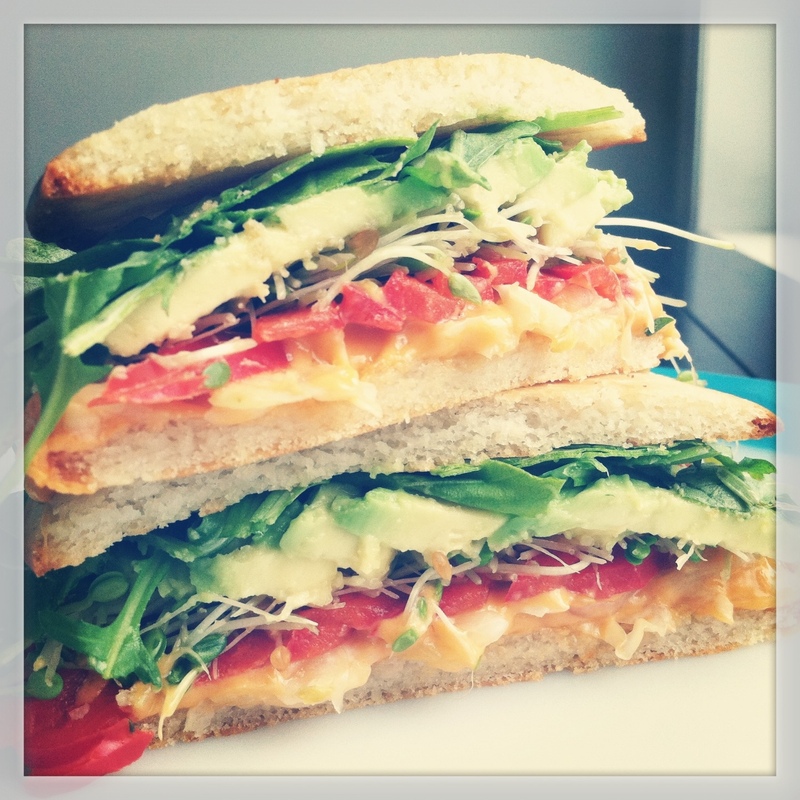 Melted Daiya, sauerkraut, avocado, sprouts, red bell pepper strips and arugula. So good! Avocado and sauerkraut sounds strange, I know, but they compliment each other really well. Whoever said vegan food is boring is a fool. I also tried the Daiya mozzarella shreds and was not pleased. Strange flavor. The cheddar was better! I agree vegan and vegetarian meals are so far from boring. They’re colorful, so delicious, and full of sunshine as I like to say!! I will be trying to imitate that sandwich…yum! I’m terrified of Daiya. Period. Lol! I was too but I finally took the plunge. There’s nothing terrible in it and it’s not like I’m going to add it in every meal, sparingly at best.